The team behind The Outdoor GreatRoom Company™ was the first to enter into the gas fire pit category and with that expertise we can offer over 50 gas fire pit products plus Do-it-Yourself Gas Fire Pit Kits and custom fire pits to turn your patio or backyard into your dream outdoor room! Most of our fire pits are made in the USA and are UL listed for safety. The age of the Outdoor Room has arrived and now there is something for everyone. The team behind The Outdoor GreatRoom Company was the first to enter into the gas fire pit category and with that expertise we can offer over 50 gas fire pit and fireplace products. 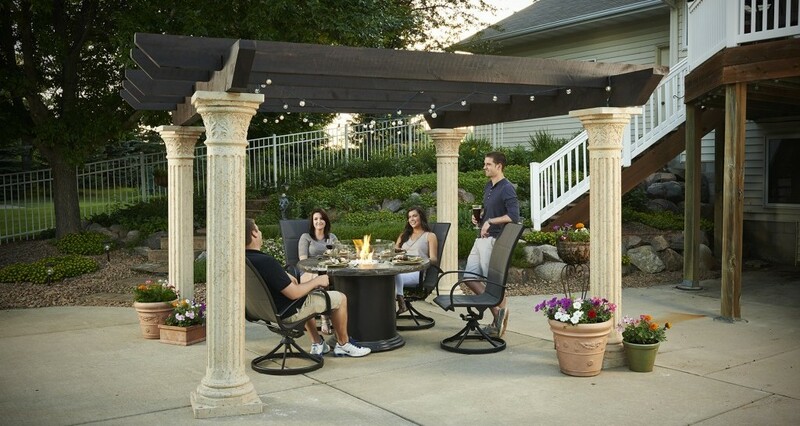 We also offer pergolas, outdoor furniture, outdoor kitchen islands, and grills to complete your outdoor living space! Looking inside? Not only can we help with your outdoor room, but we’ve gone inside with electric fireplaces. GreatCo., a division of OGC, carries hearth products to add instant ambience to your home. With many options including six linear electric fireplaces, an electric fireplace insert, and two styles of built-in electric fireplaces, we’ve got you covered no matter the size or style of your space. Browse our Photo Gallery of ideas for every space – inside or out, large or small. Our Gallery Collection Electric Fireplaces and hearth products add instant ambiance to your home. With many options including six modern, linear wall-mount electric fireplaces, two electric fireplace inserts, and two styles of built-in electric fireplaces, we’ve got you covered no matter the size or style of your space. To view their complete product line CLICK HERE to visit their website.